An assemblage is a work of art that is three-dimensional and is made up of found objects. It’s cousin the collage is primarily flat (2-dimensional) and made up of various torn or cut paper scraps. When you begin to add textured fabric or bottle caps and buttons to your collage, you may want to spice it up and categorize it as an “assemblage” instead. Motivation: I believe that materials are the best teacher. 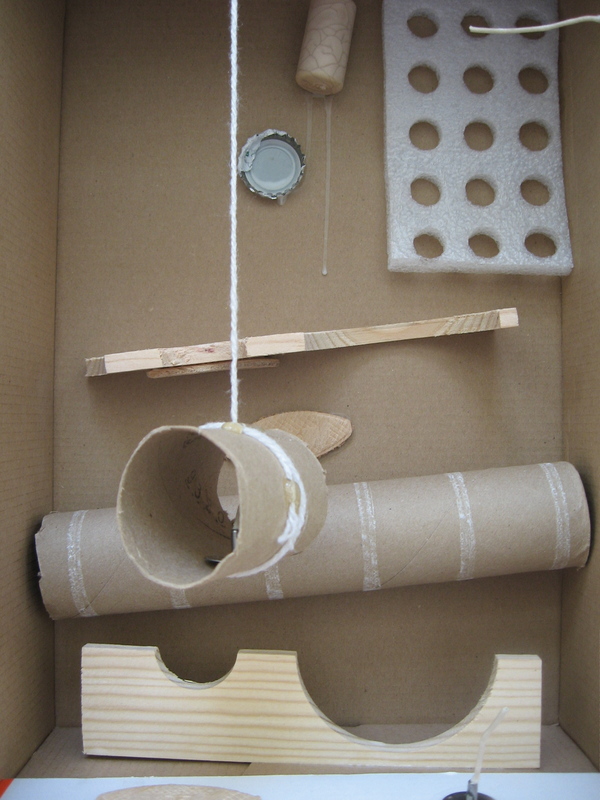 When given a selection of found objects and glue, students can think of a hundred ways of creating something that is meaningful to them. I like to have a selection of the materials with me during our circle introduction to discuss the ways in which we could use the shapes to form an assemblage. Rather than tell them how they should use the shapes, I talk about background, foreground and the use of the box as a three-dimensional space and let their imaginations decide how they wish to manipulate the objects to develop their confined space. Have a few images of Cornell’s assemblages for students to view and discuss. Talk about overlapping, storytelling and ways in which you can make your assemblage interactive. Lesson Development: Students are given collection trays and limited to 10 objects to start. Once they use those objects, then can go “shopping” for more. Once a student comes up with an interesting way of using a material, her classmates will want to try it as well. This is a great opportunity to take the time to discuss what it means to be “inspired”. I tell my students that there is no such thing as copying in the art studio and when someone uses your idea, it is because they are inspired by you, and that it is really special that you invented something that others think is great. 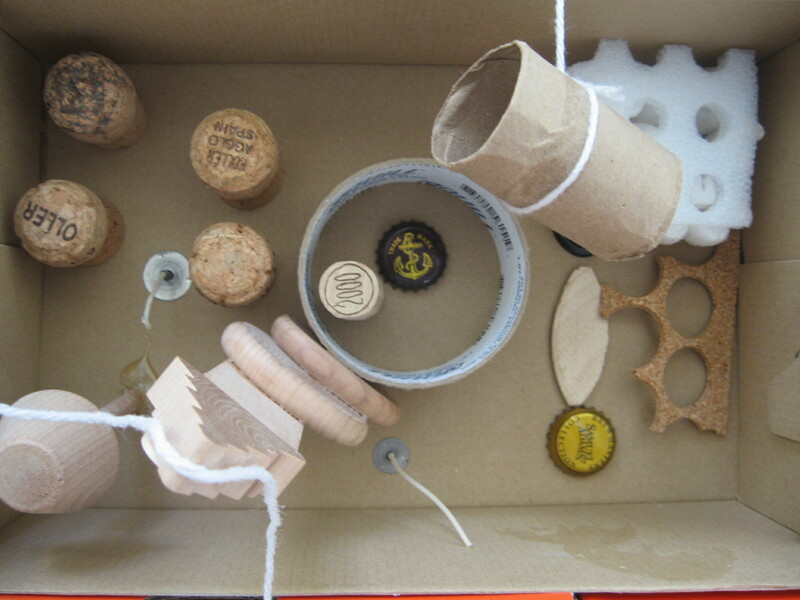 Materials: I keep a container in my kitchen for corks, bottle caps, paper towel rolls, cans and just about anything that I can clean easily and that will inspire a sculptural creation. The two assemblages in this post were created inside shoe boxes that were donated by a local shoe store. Local lumber yards may have wood scraps that you can salvage. I quickly brush over woods scraps with sand paper to remove any stray splinters waiting to happen. A strong tacky glue works best for this project and it is extra safe to have a low-temp glue gun handy to help make the impossible possible. And if anyone is in the New Hampshire/Maine/Mass area, they could view an exhibition of assemblage, collage, and box art at the Gafney Library, 14 High St. Sanbornville, NH. April 1-30, 2012. Artists Reception, Saturday, April 14, 2012 from 11:30 AM to 1:30 PM. Art Engine is an archive of maker experiences for children with a focus on how language and environment influences our artistic potential. Discover a wide selection of inspiring and engaging art adventures that will open your mind up to the infinite power of the creative process.